At each of our Master Classes in Communicating with Stakeholders, there have been a range of benefits that participants report come from the new knowledge, skills and resources received. These include additional project funding, improved personal confidence, presentations with greater impact, development of new communication resources, and more successful media interviews and report writing, to name a few. And also after each of the Master Classes we hear from participants who make use of the training and resources to do their own communications training. This was certainly the case after the training in the Pacific last year. The benefits of attending the Master Class in Communicating Research to Stakeholders are being shared within the palm oil industry in Papua New Guinea (PNG). 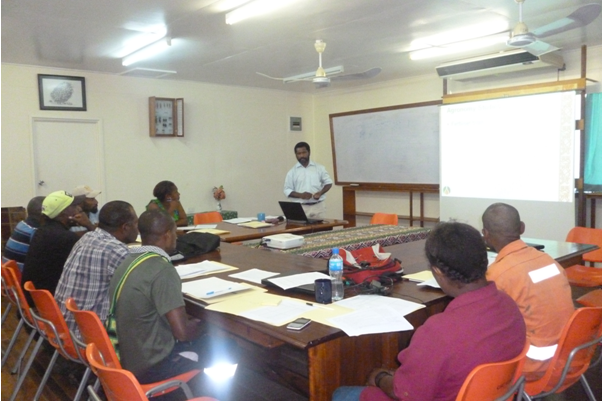 Dr Murom Banabas, who is the Head of Agronomy at the PNG Oil Palm Research Association Inc, attended the Master Class and since returning to PNG he has organised communications training with other staff so that they may benefit from the knowledge he gained. The first activity after returning to PNG was to conduct a three day workshop for all the agronomists, agronomy supervisors, senior recorders, agronomy data entry clerks and staff in the smallholder studies research section. The staff who attended presented a topic related to their work, followed by a discussion. A session was also held regarding developing a communication plan, emphasising the importance of audience, the content and style. A second training session was held just to developing communication plans for staff in Pathology and Entomology Sections. Another series of three training sessions were provided to Technical services staff at Guadacanal Plains Palm Oil Limited (GPPOL), an oil palm plantation company in the Solomon Islands. Two sessions were dedicated to technical topics, and the third to communication planning. There are plans for another series of training workshops later in the year, on communication planning for industry smallholder extension officers and sections within the company that deal with smallholder farmer affairs. The training will also roll out to other sites in the country.